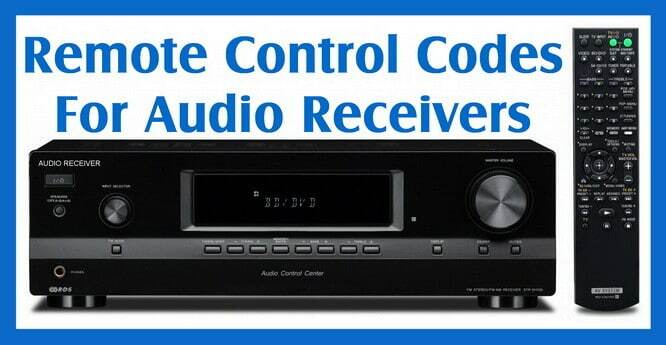 Audio Receivers remote control codes. If you have recently bought a universal remote control and you need the remote codes to operate your Audio Receiver, we have codes below for Onkyo, Denon, BOSE, Sony, Pioneer, Regent, and Yamaha receivers that will work to program and control your receiver or tuner. If the first code does not work, keep trying the numbers on the list and you will find one that will work with your stereo receiver. Do you need a remote code for your Stereo Receiver that is not listed here? Please leave a question below and we can find the remote code you need. Turns off my Yamaha Receiver. (Code 1596) but isn’t able to turn it back on. I have tried all the codes listed, but none will turn the receiver back on. Please let me know if there is another code that will work. I’m looking for a 3-digit code; the remote is a Humax RM-101 and the target is a JVC UXD750 mini hi-fi. I’ve tried all the ones in the Humax manual – no joy. What is remote code for Yamaha htr5740 receiver? Hi I need the code for an old Denon AVR 1100-RD (can’t find it). Need code for Sansui Audio receiver model: RZ-6900AR please. I need to find the code for my amplifier system. I have a Panasonic tv with Comcast/xfinity X1. I am switching the xfinity remote to the voice remote. We do not listen to sound coming from tv itself, it goes through B and K components LTD amplifier out to surround sound speakers. Currently, universal remote turns all systems on and off, changes volume level, will change cable channels; however, we only use the Comcast remote for changing channel, accessing recordings, Netflix. I would like to see if we can have my XR11 remote turn my tv off and also the amplifier. The problem is I cannot find any codes or name for this B T K amp, it was sold to ATI, now somebody else owns it. Are you able to provide me with the code or the new manufacturer name please? I need code for Denon cdr w1500 AND Denon dra 425. Looking for a 4 digit code for a Sharp XL-uh240. The ones that came with my universal remote do not operate the track forward and reverse which are needed as they are not on the face of the radio. What do I enter for Nakamichi if it’s not listed as an option in my LG Magic Wand remote? Neither is Sunfire, which has the same code. Need either a replacement remote or the codes for my Pioneer VSX – 925 – K A/V receiver. Looking for code and remote for Cambridge Soundworks Model CD88. I need to program my Xfinity Voice Remote so that it can control the audio of my Sharp 1-Bit Digital Home Theater SD-AT1000. Can you help me by providing a code that’ll work? I have a Yamaha receiver RX-V559 that I need the correct code for a universal remote. I have a Yamaha AV receiver RX-V793 and cannot find the right codes to program the remote using any of the numbers listed. Any other suggestions? I’m just wondering if you have the codes for a Oskar digital karaoke av amplifier Az-610. Need codes for Genesis Media Labs g506 5.1 AV Surround Sound Receiver for a Yamaha wc55280 us rav250 a/v surround universal remote control. I have a Marantz receiver sr5600 I picked up a universal remote for it a black web 6 Device. I am having trouble finding the code from that universal remote device to control my Marantz. I have tried all the codes that came with that device for that receiver. need a universal rc code for my JVC RX 430-V Audio/Video Control Receiver. Need remote for denon stereo receiver dra-685. Nead remote for Yamaha subwoofer receiver SR-301. Hoping to pair my XR11 (Cox Cpntour 2) with my Cambridge Audio Azur 650A. Any help appreciated!! I’m looking for a code for an old Sony MHC 5500, remote model number RM-S500. I need codes to operate a vintage 1996 AudioSouce PreAmp Tuner Two for a Direct TV remote. Thank you. I have a JVC XVTHD60 home theater receiver and none of the JVC codes work. Can you help? Do you have codes for an Optimus Stav-3790? I have an RCA universal remote, RCRBBD04GR I need a code to control my acoustic audio surround sound system. I received a HARMAN/KARDON model MAS 100, but its remote is missing. Sadly, no remote means I cannot switch audio source, as the front panel lacks almost all commands. Can you get the codes for a Pyle p3002AI hybrid amplifier? Have the new dish network Wally receiver and remote. Tried all the options to find the code to control a Yamaha RX-V2500 receiver (about 11 years old). How can I use my dish network remote to control my Panasonic VSX-5600 AV receiver? I’ve found a list of function keys for the 5600, but how can I program the dish remote per function (short of just assigning 1 key for the entire Panasonic remote)? I’m looking for the ir code for a theater research tr-6030 5.1 surround sound. looking for volume control codes for the yamaha RX-V390 receiver. Hi… I lost remote control of Yamaha audio turner T-D500. I bought a universal one but codes are not working… Can you help me??? I need a code for my audio receiver SONY CFD-626. I need a remote code for a pioneer receiver. Model vsxd 603s. Thank you for any help! I need code for a All In One remote model 5650 to be used with a Mitsubishi receiver DA-F158. I was wondering do you have a code for a Acoustic Audio AA5210 made by Goldwood surround sound system (with bluetooth) on a Direct TV RC-73 remote! I need the code for a Sharp xldk255 audio system. I need a remote code for a Marantz nr1603 receiver. I have an RCA universal remote model RCRBB04GR. Nothing seems to work. I can’t find any codes for my Evolve SB-2501 soundbar to use with my Sky Q remote control. Can anyone help or does anyone know if a code from a different make of sound bar would work? Have a Yamaha av receiver 4x-v371. Remote is an RCA two channel RCRPSO2GR. Xfinity 5 digit remote code for the Pioneer VSX 830 AV Receiver? Try searching on the Pioneer Receiver HEX and IR codes page to find a remote code or to fully program the remote for every function. I have a Yamaha R-S500 stereo but cannot find a remote code that works on my dish controller. What is the model number of your Dish Remote Control? I need a universal remote that can control an Outlaw Audio 2150 receiver (first generation). I know that Logitech units will work. Any others? I have an old Sony STR-AV910 stereo receiver. The RM-U100 remotes, original and 1 used from ebay, have died. New batteries failed to revive. A new replacement for this remote is not available and it’s not clear that a Sony universal will work. I cannot find the codes for this stereo receiver. Sony has a teachable universal remote Model RM-VLZ620. It uses the following codes for Sony devices of interest: Blu-ray Disc player – 11516, CD – 70000, Amp – 82586. My principal needs are, Pwr on/off and Volume control. Anything else would be great but not absolutely necessary. Of concern is that the VLZ620 is not listed as a replacement for the RM-U100. The VLZ620 has a learn function but it requires a working remote which I do not have. Short of buying a new receiver, is there a universal remote solution for this problem? We believe the exact remote you need IS available. Check here for the SONY RM-U100 Remote Control. This custom built replacement remote performs all functions the same as the original remote did. This remote is Custom Built for your product, and Does Not require any programming. We install fresh batteries just before shipping to you. It is guaranteed to work right out of the box! Compatible Models: 1-473-698-11, 147369811, RT147369811, RMU100AV, SAVA100. I am looking for remote control codes for an Xfinity remote to control a TEAC AG-V8520 receiver and a Vector Research VRX-6200R receiver. Tried codes for our JVC RX-309 FM/AM digital synthesizer receiver but no luck yet. I need the remote control code for my Pyle Sound Bar, model number PSBV200BT. Thank you. I have Pyle 5.1 receiver and I need a code that will work on my Comcast remote so that I can turn both my TV and the receiver on from the Comcast remotes. Hello, I need a remote code to control my Logitech z5500 sound system. I have a Yamaha stereo receiver model No. RX397 with a remote control with the model number RAX16 (serial number WF67630) and this remote has failed completely. I need to know its control codes so I can purchase a universal programmable remote to replace it. Did you misplace the SONY STR-K700 Digital Audio Receiver DTS/DOLBY II remote? Are you suing another remote? If so what brand is it? Need new OEM remote? – see here. We need a model number and exact name of the surround sound bar or equipment. Please check all areas and get back with us with model number. You can try remote codes 1004 or 0165 for your Luxman Receiver. Need remote codes for AudioSource S3D60 Sound Bar. Durabrand HT 3917 speakers need the code please. I cant find any codes for my pyle pt595aubt hdmi blue tooth receiver any help with this would be awsome.